Okie dokie party people. Here it is: the second part of my How To Live Frugally in Luxury Like A Bohemian series. I got great response from my first post and I'm actually kind of surprised because I felt I was being a bit of a know-it-all... like, "Oh, look at me! I speak for the bohemians. I am all knowing." But I'd like to think I did I good thing by bringing this topic to light. Bohemians are so dang mysterious and I know people do wonder about the "secret lives of bohemians" (cue ominous music and thunder roll). These posts contain info from real bohemians I know, bohemian bloggers I follow and of course myself as self proclaimed quirky bohemian mama. Enjoy. Bohemians love unique and completely original clothes and home decor and oftentimes the only way to get that is to make it yourself. Making items yourself can save you a ton of money if you create with materials you already have (upcycling ). Examples? Make curtains out of your mom's old silk scarves , unravel an old sweater to knit a scarf from the salvaged yarn or sew a dress out of bed sheets.You don't have to be a super skilled artisan to be a DIYer. Sometimes all you need is Pinterest and a glue gun . Bohemians tend to have a wee bit of a hoarding problem when it comes to craft supplies and junk. They just can't bear to throw something beautiful away when they know it can be repaired and revamped with just a little bit of super glue and paint. A bohemian never throws away broken jewelry because it can be used to make new jewelry. If they've obtained a hideous 80s prom dress that's beyond revamping. You can bet they're going to harvest the sequins and rhinestones off of it before they toss it! Bohemians don't just DIY fashion and home goods, they love a good challenge and will take on bigger projects like creating their own musical instruments and converting school buses into motor homes . Pinterest is a great place to find inspiration and links to great tutorials for amazing projects you never would have thought of. It is absolutely filled with hundreds of thousands of DIY projects. I find tons of great DIY inspiration there and many of the projects are super simple and can easily be done with materials I have right at home. I'm not going to talk about me here. Instead, I'd like to feature someone much more worthy of praise than myself. 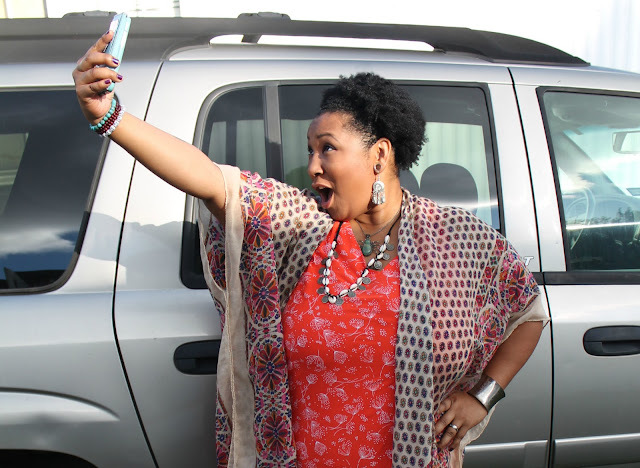 Allow me to introduce you to blogger and bohemian queen Vix of Vintage Vixen. She is a master upcycler and DIYer, she's thrifty AF and lives a life in supreme boheme luxury. If you're looking a perfect example of frugal creativity, you can see all of her DIY posts HERE. Trust me, you're going to want to see those posts!! Don't get hung up on wearing used clothing. If you've got a washing machine, then you've got nothing to worry about (unless the previous owner had a flesh-eating virus). Thrift shops and flea markets have gently used and even new clothing and shoes at super low prices, and it'd be crazy to not take advantage of that. Remember, the less you spend on one item, the more stuff you can buy! Bohemians LOVE shopping at yard sales, flea markets, and charity shops because not only are the prices low but vintage clothing and antiques are timeless and better often time quality than modern goods, and hellooo- $0.25 paperbacks? Yes, please! Let another man's trash be your treasure. This point brings us back to, "DIY & Upcycle ". If you see a side table you like at a flea market for $4 but it's just not quite the right color for your living room, then buy it anyway and repaint it! Holes can be mended, scuffs can be buffed out and silver can be polished . Don't let the current states of any item hinder you from buying if you really like it. Give it a new home and fix it up. The majority of our home decor and furniture was bought used. If anything in our home was bought brand new then it was most likely a wedding gift. Almost all of our large appliances came from liquidation stores, most of our home decor came from flea markets, thrift stores and curbside finds. If any home decor was bought brand new, it was most likely bought right from the artisan at a festival. A rare glimpse into my home: The lamp was about to be trashed by some guys and I saved it and added the trim. 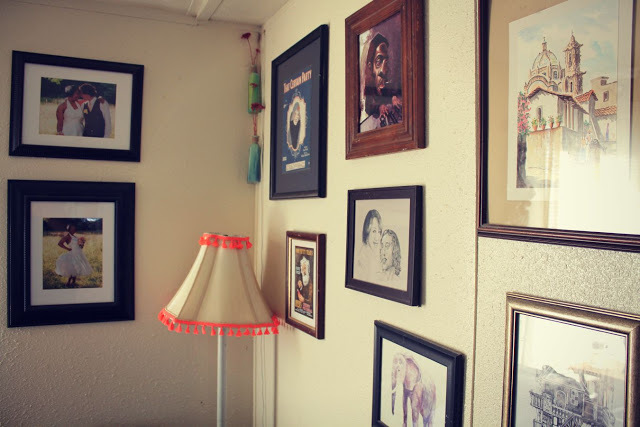 Most of the frames were thrifted and the art was thrifted, found or taken out of magazines. Bohemians don't have expensive taste per se but they do like rare and exquisite things that can cost a pretty penny such as antiques and original art and even festivals and overseas traveling. Since most bohemians have an artistic ability of some kind, they'll use their talents to help them obtain extra money so they can buy all of those pretty sparkly things like an antique Afghan necklace or... plane tickets. I have a love-hate relationship with the term "hustle". I don't know why. Maybe because it's one of the hot new things for millennials to do and I just can't stand trends but by golly, I'll admit it's a good trend. Hustling, or doing things for extra cash, isn't new by any stretch of the imagination but bohemians feel that if you're going to spend hours doing something you love to do then you might as well get paid for it too! Are you an excellent guitar player or pianist? Consider becoming a wedding soloist on the weekends. Do you love sewing? Open an Etsy shop and sell your original work. Do you like to act? Sign up to be an extra in movies. And who knows? You might be so darn good at what you do that your hobby can now be your full-time job! Also check out Vix's blog to see posts about her hobby-turned-business! Oh! And you can also find some great boho-entrepreneurial tips at Vanessa Alvardo's blog. I've created a lot of side jobs for myself in the past. When I worked full time at a bank many years ago, I used to buy vintage clothing, clean them up and sell them on Etsy. Later I turned to making and selling jewelry on Etsy but quit when my babies were born (too many choking hazards!). I used to make fascinators and upcycled stationary too. I've always loved to write and I've been keeping some kind of online journal since I was a teenager so needless to say, when I discovered that it's possible to make money from blogging , I hopped right on it. Not because I'm greedy mind you, but because I'm a stay at home mom and I home school. I needed a way to help bring in extra money at home at a time when me and my husband were hitting seriously hard times financially. I went on to start my own social media management service because I learned so much about social media marketing while blogging, that I decided to do it for other people. How To Live Frugally in Luxury Like A Bohemian: Part ONE. There's one more post coming so please be sure to subscribe to my newsletter to make sure you don't miss it! (Form at the top of the blog). My craft/sewing room is crazy with supplies - you never know when inspiration will strike! Most of my stuff is other people's destashes or was given to me to clear up their spaces. Vix is amazing and always inspiring. So are you! Your bohemian craft posts make me crazy with ideas. Thank you! Thanks so much for the shout out! :) I totally agree with all the points! It's so easy to live luxuriously as a budget!